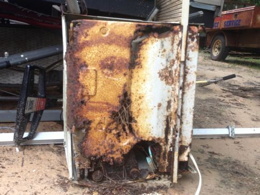 Christopher Goldsberry of Jackson County, MS said that when he saw the rust pattern on this old AC unit, he "knew who that was immediately." Of course, it was Jesus. Who else? But Goldsberry added, "The gentleman I purchased it from didn't see any of it. Think about it. They don't recognize what it is. Some people see it, some people don't. Think about that." Looks more like King Menelaus to me, complete with a metal crown formed from the divots; something Jesus wouldn't have worn. My first thought was some Anglo-Saxon or Frankish king from an illuminated manuscript (or maybe from the Bayeux Tapestry), but no, it's certainly not Jesus.